The dream of filling your garden and your home with the mesmerizing fragrance of Lavender blossoms is not a distant dream anymore as Lavandin is such a simple medicinal plant that resembles Lavender and its enriching aroma never fails to fill your home any lesser than Lavender does. As a hybrid of Lavender vera and Spike lavender, Lavandin Grosso is an excellent remedy for scabies and certain other infectious skin problems. World is a global village and it is this strong reason that turns the world towards the path of Traditional healing methodologies. Ayurveda, the mother of all healing sciences on earth is the pioneer of Complementary and Alternative Medicine. 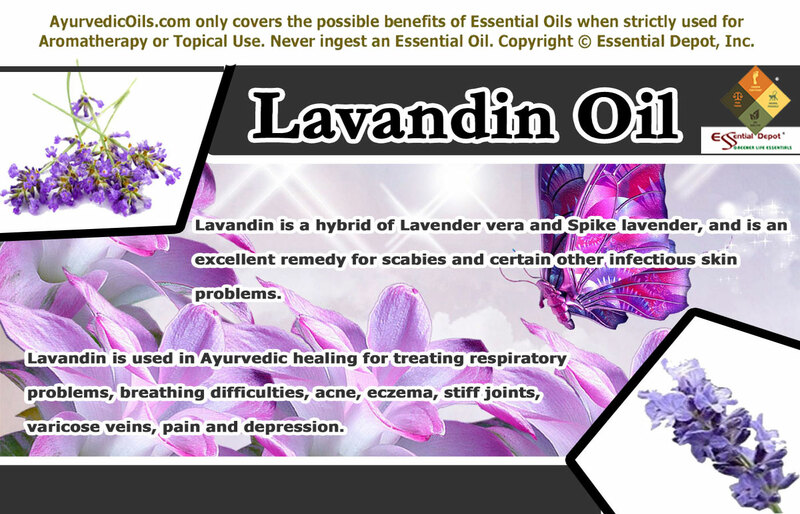 Lavandin is used in Ayurvedic healing for treating respiratory problems, breathing difficulties, acne, eczema, stiff joints, varicose veins, pain and depression. It is a hybrid variety of plants developed in the early 18th century and the essential oils extracted from these hybrid varieties were initially used for manufacturing soaps, perfumes and certain other personal hygiene products. France is known as the major producer of Lavandin plants and essential oils. Lavandin essential oils are comparatively cheaper than True Lavender varieties. This is because unlike Lavender, these hybrid varieties can be grown as a commercially viable crop and are more tolerant to various climatic and growing conditions. Lavandin Grosso is named after its discoverer Grosso and it reflects true qualities of both of its parentage with the camphoric aroma of Lavandula latifolia and the frost hardiness of Lavandula angustifolia. Among the numerous other Lavender hybrid plants, Lavandin Grosso is the most predominantly chosen plant by the commercial Lavender farm growers as it is easy to grow in most regions and produce abundant Lavandin flowers that contain ample amount of essential oils. The big and bright flowers of this plant are also used for making sachets (keeps your clothes fresh and protect from moths and other insects) and the long stems are used in making Lavender wands. Initially, Lavandin and its essential oil were used as an analgesic and antiseptic for relieving pain, inflammation and for healing wounds and skin infections. Lavandin flowers were also used in making tea that was trusted to discharge excess mucous deposits and to assist breathing difficulties. 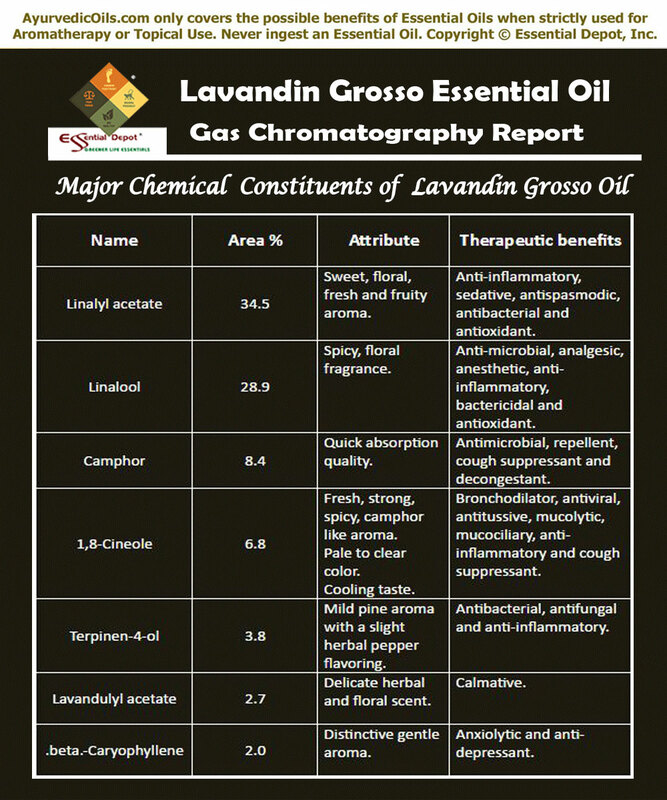 According to the Gas chromatography report, Lavandin Grosso oil constitutes of 25 chemical components that contribute to its fragrance, therapeutic attributes, consistency and quality. Of which, Linalyl acetate contributes to the highest proportion of Lavandin Grosso oil constituents with about 34.5% of its total composition. I believe that this must certainly help you in getting to know the exclusive information about these prime chemical constituents of Lavandin Grosso oil. The table crafted below clearly depicts the unique nature and contributions of these biochemical constituents to the healing magnificence of Lavandin Grosso essential oil. The remedial properties are antiseptic, antidepressant, analgesic, vulnerary, expectorant, cicatrisant, nervine, antispasmodic and stimulant. Many of us misconstrue that Ayurveda and the other traditional healing practices are meant for the old people or people who are still attached to the Stone Age. Ayurveda is the first and foremost healing methodology to love human beings and appreciate their individual identity, feelings, characteristics and behavioral patterns. When all other medical sciences in this world aim at treating illnesses, this ancient healing system focused on treating individuals and not just their illnesses. Ayurvedic philosophy declares that human beings are a part of nature and a person’s wellness or sickness depends upon his balance or imbalance with nature. 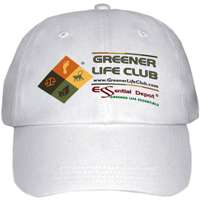 Diseases occur when an individual’s mind and body is out of balance with nature. It is for this reason Ayurvedic remedies are based upon natural medicines for striking perfect balance with an archway to prevention and healthy aging. Every individual is distinctive with a unique individual constitution that comprises of three biological energies known as doshas. They are vata, pitta and kapha. Each of these doshas governs certain functions of our body where vata is responsible for nervous functions and circulation, pitta controls metabolism and body temperature and kapha governs fluid movements, consistency and skin health. Predominance of any of these doshas determines the personality, character, physical set up and the mental makeup of a person. Imbalance between any of these doshas causes illness and Ayurvedic medications are prescribed in such a way that the imbalances are treated. Lavandin essential oil is said to reduce kapha and pitta dosha and has a neutral effect on vata dosha. Popular author Susanne Fischer-Rizzi states that Lavender has more than 167 tested and proven medicinal uses. Bryan Miller and Light Miller in their book ‘Ayurveda and Aromatherapy’ says that Lavender is a must have essential oil in your first-aid kit or travel bag. With much similar aroma and healing properties like Lavender, Lavandin essential oil is also beneficial in a number of ways especially for nurturing skin health. With excellent antiseptic, vulnerary and cicatrisant properties Lavandin essential oil has been proven effective for treating numerous skin problems. It keeps the skin clean and fights against various germs. The ability of this oil in killing germs contributes to its effectiveness in treating dermatitis, scabies and few other infectious skin disorders. Being an effective antiseptic Lavandin essential oil can assist in treating wounds, cuts, burns, boils and rashes. It protects the open wounds from being septic or getting affected by the harmful organisms in air like tetanus. The vulnerary properties of this oil helps in speeding up the process of healing wounds especially in case of incisions, surgical wounds, cuts or other accidental wounds. 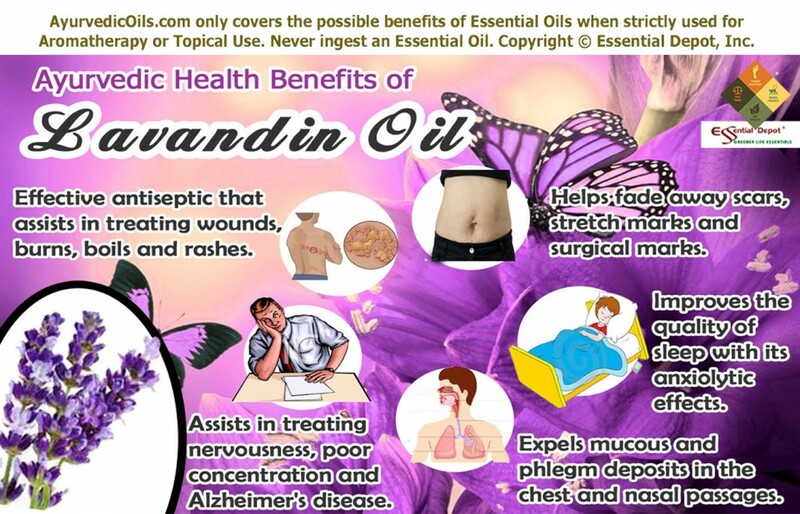 Applying 2 drops of Lavandin essential oil mixed with 1 ml of coconut oil is a sure-shot remedy for quick healing of wounds, protecting from infections and for fading away the scars and marks left by wounds, acne, stretch marks, surgical marks, cracks and other marks related to pregnancy. Lavendin essential oil improves blood circulation and encourages the growth of new skin cells which contribute to its natural anti-scarring properties. You can also blend 3 to 4 drops of Lavendin oil in 2 ml of olive oil or to your regular skin care lotion and gently massage on to the skin to clear blemishes, treat sluggishness, dry skin and for improving the natural glow of the skin. Lavandin essential oil has a rejuvenating and calming aroma that acts as an admirable antidepressant oil. The presence of camphor, linalyl acetate and terpineol-4 enhances its soothing and stimulating attributes that benefit the mind and heart in numerous ways. Lavandin Grosso oil is regarded as a great natural remedy for alleviating stress, fatigue, anxiety and depression. Certain studies have proven that Lavandin essential oil have anxiolytic effects that aid in improving the quality of sleep and save you from insomnia and nightmares. Feelings of loneliness, lack of self-confidence, insecurity, loss of love or your near ones and work pressure may drag you down and waive a red flag to all your endeavors. All you need to do is to waive back the pleasant Lavandin flag that can uplift your spirit, enhance your self-confidence, fight against depressive feelings and reassure your success. Adding 2 to 3 drops of Lavandin oil in your vaporizer, burner, diffuser, aroma lamp or bath tub can help in combating negative thoughts and grant the power to swim against the tide. Adding 2 to 3 drops of Lavandin essential oil in steam inhalation or blending 2 drops of Lavandin oil with 1 ml of coconut oil and massaging it on chest, throat and back aids in treating cough, cold, bronchitis, sinusitis, chest congestion and other breathing problems. This is mainly due to the antiseptic properties of Lavandin oil that is proven to combat germs causing respiratory problems and its expectorant values that expel mucous and phlegm deposits in the chest and nasal passages causing cough and congestion. Lavandin Grosso oil benefits the entire body by supporting the functions of the nervous system. Using it as a massage oil by mixing 5 drops of this oil with 2.5 ml of jojoba oil aid in strengthening the nervous system and activate the nerves that pass on to different parts of the body. This is of great assistance in treating nervousness, sluggishness, convulsions, Alzheimer’s disease, lack of concentration and reflexes and certain other nervous problems. Jane Buckle says “Lavandin Grosso was shown to be very effective against non-tubercular opportunistic mycobacteria (NTM) which is common in AIDS. Grosso is high in linalool for infections.” Lavandin essential oil also aids in treating pain, inflammation, rheumatism, influenza, headache, stiff joints, muscular problems etc, with its analgesic and anti-inflammatory properties. This article is only for the purpose of information and is not destined for diagnosis or to substitute any prescribed medicines or professional advice. Never use essential oils internally and always use them in a diluted form for topical application as pure and organic essential oils are highly concentrated liquids and may cause harm if not used properly. Prevention is better than cure and it is always advisable to consult your Ayurvedic practitioner before choosing the right essential oils for your unique constitution and health condition. The MSDS (Material Safety Data Sheet) of Lavandin Grosso oil is readily available for your enhanced safety and better usage. 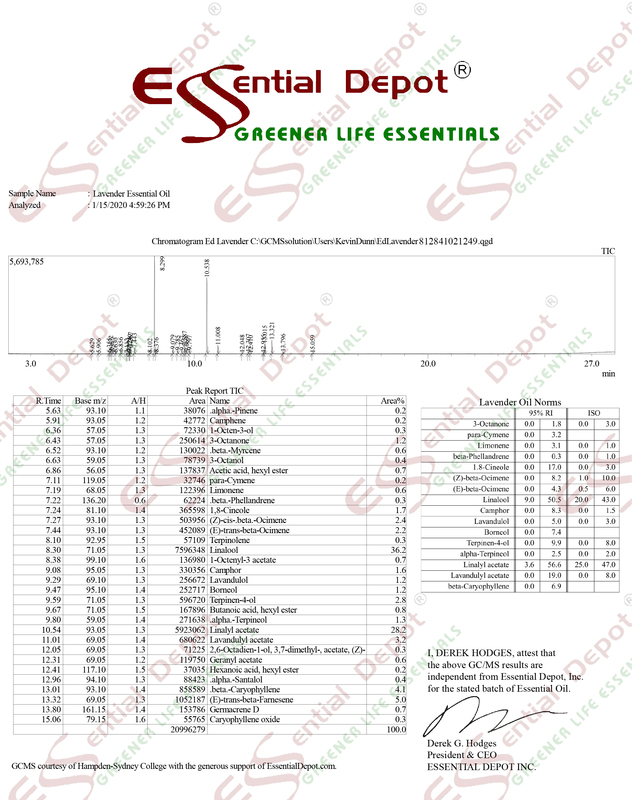 Gas Chromatography Report (GC analysis) of Lavandin Grosso oil.